I’d like to share this news with you: one of my seniors in my Karate lineage, Sensei Michael Chapman, passed away on Sunday, August 16, 2015. Sensei Chapman had been deeply involved in the Canadian Karate scene for decades. He ran a club in Haliburton, Ontario, up in a beautiful section of the country, “cottage country” as we are apt to call an area with lots of hills, lakes and forests. He enjoyed fishing, so the area obviously, forgive the pun, came naturally to him. When one thinks of the expression “old school karate”, Sensei Chapman’s serious and no-nonsense approach on the floor always came to mind. Hard to the core, he could give it, and take it. And that straightforward approach also carried over to the way he treated other people: he was honest about the way he felt; he was direct; he spoke his mind…but you knew you could always believe in what he said. There was no subterfuge in the man, no sly, cowardly ways. He was, like his famous punch, honest and strong. And beneath the strength, he was kind and caring. He could bring a smile to the face of a nervous child, and gently coach her or him to a new level of confidence. If there were any martial art events anywhere, and he knew you, he’d rise early in the morning up in “cottage country”, collect a few other early starters, and travel to wherever in support. Tournaments, gradings, seminars, meetings…it didn’t matter, he would travel the distance to give you his support. And he traveled the distance with his students as well, changing a lot of lives, both young and old, across the years. His students were lucky to have Sensei Chapman as their instructor because he truly cared about them and how they were doing in their lives. One more observation: Sensei Chapman was one of the best tournament head referees around. Other Black Belts flocked over to be a part of his ring. Caring, he made sure that everyone was treated fairly and that the tournament experience for everyone who passed through his ring was more than just about medals and winning but more importantly about the spirit of friendship as exemplified by Karate. I invite your comments and remembrances via e-mail at rwalther@kos.net, and will add them to this post as they come in. 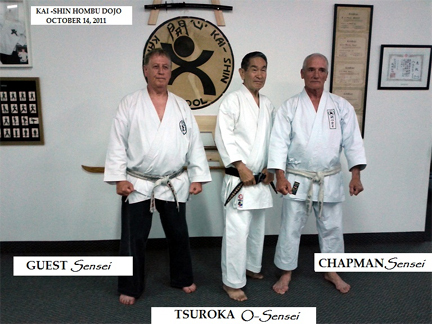 Thank you on behalf of everyone who knew Sensei Chapman. We had a great teacher in Chapman Sensei ...and a dear friend. It's not often in life that one finds them both, in the same person. Beautifully worded, fantastic tribute. Couldn't have described him better myself. He will be truly missed. He was loved and respected... He will be missed!